PanARMENIAN.Net - The Prime Minister of Canada, Justin Trudeau vısıted Tsitsernakaberd monument to pay tribute to the victims of Armenian Genocide. He was accompanied by the First Deputy Mayor of Yerevan, Kamo Areyan and Minister of Foreign Affairs of RA, Zohrab Mnatsakanyan. 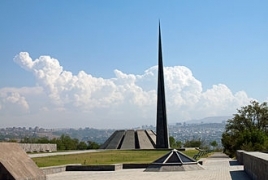 Director of Armenian Genocide Museum- Institute, Harutyun Marutyan presented the hıstory of Tsitsernakaberd monument dedicated to the victims of Armenian Genocide to the Canadian Prime Minister. Justin Trudeau also walked in the museum-institute, left a note in the Commemoration Book then planted a symbolic tree in the Tsitsernakaberd alley. Senate of Canada recognized Armenian Genocide in 2002.